The information can be typed in and edited just like a BASIC program, making it very easy to create and edit databases. The format of the database is chosen by the user, and consists of any number of named fields of specified width. 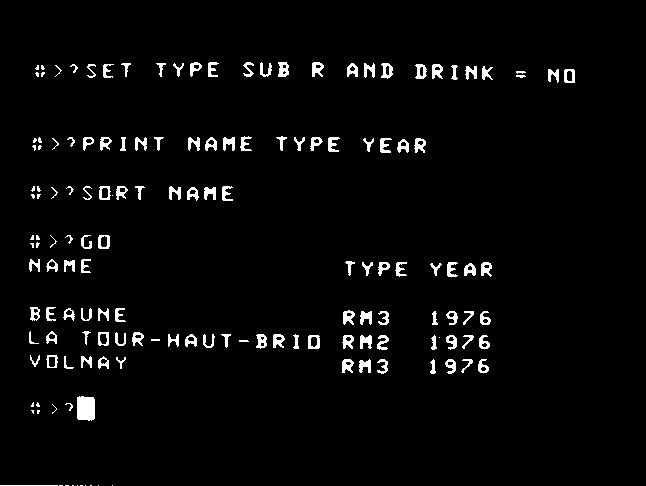 The program includes commands to list subsets of the database, and output the database to a printer with full control over the output format. Subsets of the database are selected with a versatile testing command, allowing searches for equality, substrings, and alphabetical inequalities. The data can be sorted into alphabetical order of any field, and will sort 100 records in under 20 seconds. The ATOM DATABASE comes complete with a 16-page booklet giving full instructions, and a sample application. Give all values taken by field, edit database, leave program, list fieldnames, execute search, specify fields to be printed, switch printer on/off, renumber database, reset, specify search, sort database on any field, print current test, discard, sort.